Dr. Michael R. Lund joined the Department of Obstetrics and Gynecology at the Medical College of Wisconsin as an Assistant Professor in August, 2000. 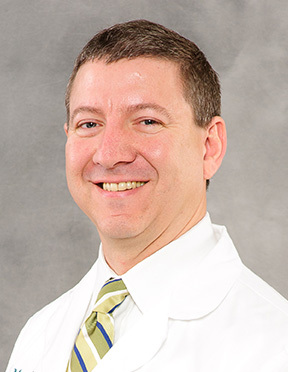 After receiving his Doctor of Medicine degree from the University of Iowa in 1996, he completed his residency in Obstetrics and Gynecology at the Medical College of Wisconsin. Dr. Lund cares for patients with a wide variety of concerns related to reproductive health and pregnancy. He cares for patients with both low-risk and high-risk pregnancies, and delivers babies at the Froedtert Birth Center in Children’s Hospital of Wisconsin. His gynecology practice includes the whole spectrum of gynecology, from routine preventive health examinations and care to abnormal Pap smear evaluation, abnormal bleeding, menopause concerns, etc. Dr. Lund has performed both clinical and educational research, and he has mentored several resident physicians who have won our departmental Resident Research award. The articles that Dr Lund has published include topics of patient knowledge of HPV. Awards and honors include the Association of Professors in Gynecology and Obstetrics (APGO) Faculty Award for Excellence in Teaching Award in 2003, the Council on Resident Education in Obstetrics and Gynecology (CREOG) National Faculty Award for Excellence in Resident Education Award in 2001 and in 2009, the MCW Outstanding Medical Student Teacher Award in 2007, 2013, 2014, 2015 and the Ernest O. Henschel Clinical Teaching Award for being the best clinical faculty teacher at the Medical College of Wisconsin by the graduating medical student body in 2010. Dr. Lund has been inducted into MCW’s Society of Teaching Scholars in 2013 in recognition for his teaching excellence and outstanding contributions as educational scholars and educational leaders. He has been recognized by Best Doctors in America, Milwaukee Magazine’s Best Doctors in Milwaukee, and is regularly rated among the top 20 physicians at Froedtert Hospital with respect to patient satisfaction. In honor of National Doctors’ Day, celebrated on March 30, the Office of Development invited individuals to “Honor a Doctor” by making a donation in the name of a physician who treated them or one of their family members. On December 5, 2014, MCW awarded the Medical Student Teachers Award to 228 educators. A set of medical wonders celebrated a birthday over Father’s Day weekend. On November 4, 2013, MCW awarded the Medical Student Teachers Award to 191 faculty members. Michael Lund, MD and Raj Narayan, MD announced as Inaugural Continuous Professional Development (CPD) Directors for the Discovery Curriculum. It is our privilege to introduce our inaugural Continuous Professional Development (CPD) Directors for the Discovery Curriculum. Dr. Lund is an amazing and personable Doctor that takes the time to talk about you and your care. Always look forward to seeing him! Dr. Michael Lund is an outstanding doctor who provides excellent care. He is compassionate and listens to all concerns and questions. I would recommend Dr. Lund to anyone in need of an ob/gyn. Everyone seems very polite and competent. Dr. Lund is especially noteworthy in care & expertise. I have referred him to all my friends and colleagues. Simply the best. Confident and a master at what he does best. Care for his patients! Dr. Lund was exceptional. He never acted like he had anywhere else to be or anything more important than me. He discussed my concerns at the technical level I expected & I felt included in decision making. I really enjoyed Jill RN on induction & delivery she was responsive to my needs & helped me through the process of labor & delivery. As always, Dr. Lund was fantastic & professional I will refer friends & colleagues to him. His partner Dr. Lasser was great as well. I had a terrific experience with all labor & delivery nurses. Dr. Lund was absolutely wonderful. I would recommend him to any of my friends. I have been a patient of Dr. Lund’s for five years. He is a great listener and he genuinely cares about my concerns. He is timely with his responses to questions and lab results. He is great at following up when necessary. I would recommend him to any of my family and friends. He is AMAZING! Dr. Lund is an amazing doctor. He’s the type of person that is completely there for his patients. We had several losses during pregnancy, and Dr. Lund never gave up on us. He helped us to believe that it would happen for us. During the subsequent pregnancies he supported me so much, reassured me when needed, and gave us extra care near the end to make sure that our babies were delivered healthy. Dr. Lund delivered all three of our babies, is truly one of the reasons two of them are here with us today. I would highly recommend him as a doctor. VIP – red carpet experience. Best it could have been given the reason for the procedure (miscarriage). Dr. Lund is an excellent doctor and I would not trade him for anybody else! I couldn’t have asked for a better doctor for my pregnancy. Dr. Lund was outstanding! I highly recommend him to my friends and family.